Do You Need Ring Locking or Latching Din Plugs? To help you choose, here are pictures of the 2 types of socket as found on Naim equipment. Some of the cables in this section can be upgraded to gold plated DIN plugs. This Flashback Sales Naim style SNAIC 4 cable is fitted with ring locking DIN connectors, and is used to join a Naim preamp to a power amplifier, where there's no power supply in the system. The NAP 6-50 or V175, requires a power supply, such as the HiCap, SuperCap or FlatCap 2 fitted to the system. This cable can also be used to join a power amp to a power supply, as well as to join a Snaxo Active Crossover, fitted with ring locking DIN sockets, to a Naim power amplifier. This cable offers excellent value for money as it matches the audio quality of the Naim originals. It's been said by many customers they exceed it. This Performance cable is used to join a Naim preamp to a Naim power amplifier, where there's no power supply in the system. It can also be used to join a SNAPS power supply to a Naim power amplifier, as well as to join a SNAXO active crossover, fitted with latching DIN sockets, to a Naim power amp. These cables offer excellent value for money as they match the audio quality of the Naim originals. It's been said by many customers they exceed it. This cable set contains the 2 Performance cables fitted with ring locking DIN plugs required to join a Naim preamp, integrated amplifier, power supply and power amplifier together. This 2 cable set can also be used to join a power supply to a Naim intergated amplifier. These cables match the audio quality of the Naim originals, and it's been said by many customers they exceed it, and offer excellent value for money. This Performance cable set contains the 2 cables fitted with latching DIN plugs required to join a Naim preamp, power supply and a power amplifier together. NAC 32.5 and the 42.5. This is a 4 pin SNAIC type Premiere cable but does not have any power connection in it, and so can be used to join any Naim or TeddyPardo power supply or SNAXO Active Crossover to any Naim power amplifier, fitted with a 4 pin DIN input socket. It features Flashback Sales Premiere cable which many customers say gives a very open and focused sound. Like all our Premiere cables, it features damped DIN bodies and pins and so does not have a ring lock or latching DIN plug option. The DIN pin and body damping reduces possible interference from mechanical vibration effects. This cable can be fitted with ring lock or latching DIN plugs upon request, but the damping feature of this type of cable will be lost. This cable does not have any power connection in it, so it cannot be used to join a Naim preamp to a Naim power amplifier, if there is no power supply in the system. Due to the time needed to assemble Premiere interconnects, the dispatch time is 48 hours. This Performance cable can be used to join a Naim power supply, fitted with ring locking DIN sockets, to a Quad power amplifier, fitted with a 4 pin DIN input socket, - or - it can be used to join a Quad preamp, fitted with a 4 pin DIN output socket to the 4 pin ring locking DIN input socket on a Naim power amp. It features Performance cable which many customers say sounds better than Naim's own grey and black SNAIC cables. Under no circumstances can this cable be used to join 2 items of Naim equipment or 2 items of Quad equipment together. This Performance cable can be used to join a Naim power supply, fitted with latching DIN sockets, to a Quad power amplifier, fitted with a 4 pin DIN input socket,- or - it can be used to join a Quad preamp, fitted with a 4 pin DIN output socket to the 4 pin latching DIN input socket on a Naim power amplifier. 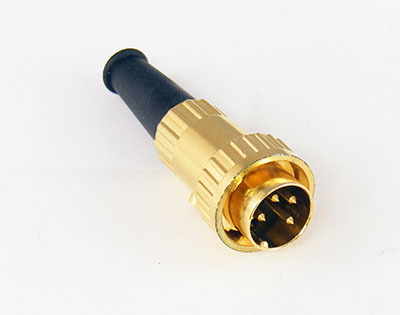 This cable features DIN plugs, manufactured by Deltron and Preh.